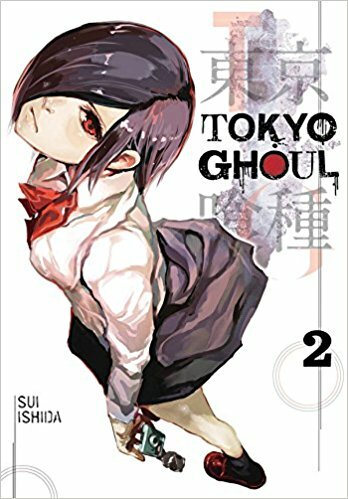 The second volume of Tokyo Ghoul picks up exactly where the last one left off. I would advise against starting to read the series here and I also wouldn’t advise reading this review if you haven’t read volume 1, as I may talk about things which would be considered spoilers for the first volume. Kaneki now works in the ghoul’s coffee shop “Anteiku” where he’s trying to better integrate with ghoul society and to learn more about them. The first volume already did a good job of humanising the ghouls and being careful not to portray them as “evil” and this second instalment takes thing even further. There is a mother and a daughter ghoul who I was very fond of (named Hinami and Ryouko) and the two of them do a fantastic job of illustrating the fact that ghouls are just people and that it can be very hard for them. This volume also introduces the Ghoul Investigators who are not ghouls who investigate things, but humans who investigate people to discover whether or not they are ghouls. Of course, this organisation was formed due to the fact that they fear the race who survive by eating human flesh, but the fact that ghouls are not necessarily bad means that the investigators are a bit of an ambiguous group. Speaking of the ghouls eating human flesh, this does of course present a bit of an ethical dilemma. How can somebody be morally good if they eat the flesh of living, sentient beings capable of feeling pain? Well, that question is answered quite satisfactorily. The moral aspect of the series is something I enjoy a lot. I was also quite pleased to see the character Touka get used more in this volume (as I expected she would after the first) as I find her very intriguing. Yoshimura, the owner of the ghoul cafe, is also a very interesting and likeable character who gets a little more focus. I look forward to seeing these two ghouls in later volumes. Overall, the second volume provides an excellent continuation for the plot. Things got off to a great start in the first volume and there has been no drop in quality in this second volume, which I enjoyed equally.